Chevrolet knows that trucks have gotten to be so expensive that a lot of people that want to buy them are priced out of the market. To help get some of those buyers looking for an affordable truck back into the market, Chevy has announced the 2015 Silverado Custom. Chevy says that this is a back to basics truck, with style. The 2015 Silverado Custom starts at a price of $33,820 for a double-cab, four-door truck with a V8 engine. You won’t get all the fancy interior trim in the truck for the price; it comes with cloth seats. The front seat is a 40/20/40, which I assume to mean it’s a bench with a fold down center console that allows a third person to ride in the front. The truck is equipped with a 5.3L EcoTec3 V8 producing 355hp at that price promising the best fuel economy of any V8 truck. Buyers can also opt for a 4.3L EcoTec3 V6. Chevy fits the Silverado Custom with power windows, power locks, a body color top cap over chrome bumpers, tilt steering wheel, cruise, and Chevy MyLink with 4G LTE. 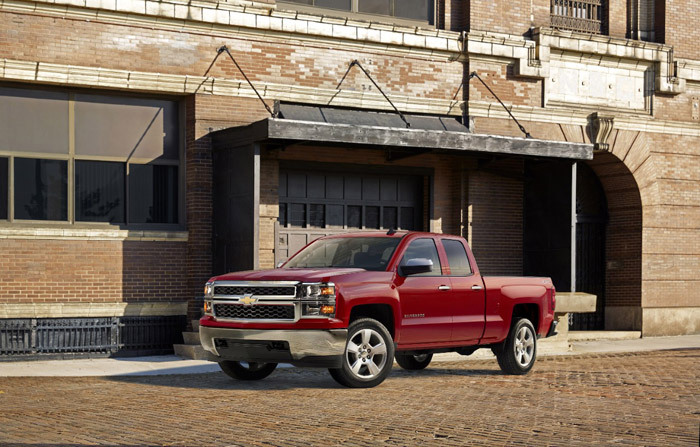 The truck is available to order starting this month at Chevy dealers around the US.